Oil comprising exclusively of oils obtained by processing the product obtained after extraction of Olive Oil and Rapeseed Oil. KTC started in 1972 from a grocery store in the heart of England. From humble beginnings we have always prided ourselves on providing the finest foods to help you create authentic cuisine, wherever you are in the world. Today we are proud that our products are widely regarded as truly essential ingredients. Put a few dessert spoons of oil into the frying pan, heat it, then fry the food, turning regularly. Apply oil to the food with a pastry brush and grill, turning regularly. 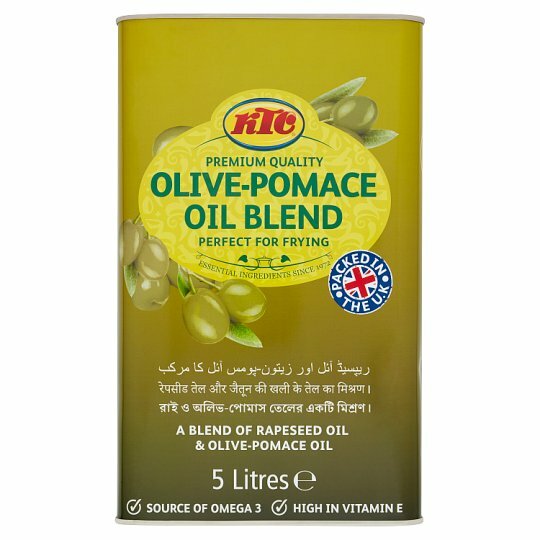 Olive Pomace Oil can be used in preparing salad dressings, mayonnaise and baking. For the best result fry at 180°C (360°F). SAFETY INSTRUCTIONS Sharp Edges, do not insert fingers into pouring aperture. Oil and fat spillages are potentially dangerous as they make surfaces slippery. The handling of hot oils and fats should be done with care and only when facilitated by use of oil resistant gloves and other suitable clothing. Do not attempt to fill with hot oil. Transport Upright.